Antonio "Bigfoot" Silva takes to the Octagon in front of a roaring home crowd once again as the 61st edition of UFC Fight Night invades Porto Alegre featuring a seismic clash between the Brazilian and former Heavyweight Champion Frank Mir. Also hosting an enticing co-main event as Edson Barboza squares off with Michael Johnson, a batch of Sunday night fights will surely be some not to miss. Here, we give you an early matchup: "The Predictor" vs.. "The Genius", as they deliver their takes on the fights on the card. The Predictor previews and gives his take before matching up with "The Genius" Will these two experts be on the same wavelength or will their knowledge come to a head? Santiago Ponzinibbio is 1-1 in the UFC with a decision loss to Ryan LaFlare, and his most recent bout was a 1st round TKO over Wendell Oliveira. Ponzinibbio was also a participant on The Ultimate Fighter: Brazil 2. He made it to the finals, but was replaced due to a hand injury that forced him out of the match. Ponzinibbio is a very aggressive fighter that is always looking to finish. He has great strength and uses a lot of movement to keep his opponents guessing. Seems to have problems with solid wrestlers. Sean Strickland is 2-0 in his UFC career with an early disposal of Bubba McDaniel by rear naked choke and a very close split decision victory over Luke Barnatt. Strickland is dropping down to welterweight after competing at middleweight for most of his young career. At only 23 years old, Strickland is a well rounded mixed martial artist. His 15 career victories are as followed: 7 by KO/TKO, 4 by submission, and 4 decisions. Genius: I agree, Ponzinhibo may have a good 1st round, but will gas in the 2nd and 3rd. Strickland will outpoint and out position him. Strickland via unanimous decision. Iuri Alcantara is currently the #8 ranked bantamweight in the UFC. He has a 6-2 record inside the octagon along with 1 no contest. Alcantara is a veteran of the sport. He mixes his striking and takedowns very well. He can finish the fight on the feet or on the ground. Alcantara has 13 KO/TKO and 12 submission victories in his career. Just a well versed UFC veteran for the most part. Frankie Saenz has only 1 fight with the UFC, and it was a decision victory over Nolan Ticman. It was a dominant victory for Saenz as he used his wrestling very well to defeat Ticman. Saenz has great cardio and seems to be well rounded. Started his UFC career late, is already 34 years of age. Prediction: It's hard to see how good Saenz really is, with only 1 fight in the UFC, against basically an unknown fighter in Nolan Ticman. With Alcantara, I know what I'm getting. A very cage savvy veteran that can end the fight anywhere. I see Alcantara feeling Saenz out in the 1st round, and most likely getting the finish late in the 2nd round. Alcantara defeats Saenz via submission in the 2nd round. Genius: Alcantara via 1st round RNC. A little bit too much for Saenz in his 2nd bout. Alcantara is way too experienced and saavy to slip up. Adriano Martins is 2-1 in his UFC career, with his 1 loss coming to #3 ranked lightweight Donald Cerrone. Martins is a good striker, and is also capable of holding his own if the fight hits the ground. Most of his victories come by KO/TKO, 12. He has 2 victories by submission and 11 by way of decision. #14 ranked Rustam Khabilov is 3-1 in the UFC with a fight of the night performance victory over #13 ranked lightweight Jorge Masvidal. His 1 UFC defeat came by the hands of #5 ranked lightweight Benson Henderson. Khabilov has exceptional wrestling, and his striking is improving every fight. Looks to get the fight to the ground and control his opponent. Genius: Khabilov is better everywhere. I think he takes him out in the 2nd via ground and pound TKO. Khabilov via 2nd round TKO. Cezar Ferreira is 4-1 in the UFC as of now, and was the winner of the inaugural TUF Brazil. Ferreira loves to stand and bang, and throw his punches with a lot of power. Lives by the sword so to speak, knock out or get knocked out. Which is strange because he is a 3rd degree black belt in Brazilian jiu-jitsu. Not afraid to go to the ground, if taken down because of his jiu-jitsu, but rarely looks for takedowns himself. Sam Alvey only has 2 fights in the UFC and boasts a 1-1 record. Alvey competed as a welterweight on TUF 16 for team Carwin. Alvey is more of striker than anything else, but has decent wrestling. Alvey also rarely looks to take it to the ground, unless opponent is having success on the feet. Prediction: I feel this fight is going to be over quickly. Ferreira will come out swinging like usually and get the early KO. I just don't see Alvey being able to withstand the power of Ferreira. Ferreira defeats Alvey via KO in the 1st round. Genius: I agree again! Alvey is very flatfooted and lacks good movement. Ferreira will catch him early. Ferrreira via 1st round KO. #12 ranked Michael Johnson comes into this fight with a 7-4 record inside the octagon. Was a streaky fighter when he first came into the UFC, but has reeled off 3 straight wins. Johnson's striking has grown leaps and bounds since his UFC debut loss to Jonathan Brookins, which was TUF 12 finale. Has great wrestling, but still prefers to keep it standing due to his improved striking. Nearly a year since his last fight, that being a decision victory over Melvin Guillard. #6 ranked Edson Barboza will be stepping into the cage with a 9-2 UFC record. Barboza is a striker, a very dangerous striker. Uses punches, elbows, kicks, knees, you name it, he'll throw it. Very diverse striker, mixes it up very well. Has absolutely brutal leg kicks. 2 of his 9 UFC victories have come by TKO via leg kicks. Can hold his own on the ground. Barboza has a suspect chin. Was basically leveled by a jab, then Donald Cerrone was able to lock up a rear naked choke to finish Barboza. Has a highlight KO of Terry Etim, via spinning head kick. Go check it out on YouTube, trust me, it's worth your time. Prediction: Although I think Johnson would have some success against Barboza by using his wrestling, I don't see that happening. I believe Johnson will try to strike with Barboza and that will be a mistake. Barboza will use kicks to keep Johnson at a good distance and fight his fight. I see a competitive fight early on, but I see Barboza finishing Johnson late in the 2nd. Barboza defeats Johnson via KO in the 2nd round. Genius: I'm going with Johnson in an upset. Barboza is the better striker, but Johnson can definitely hang in there and land his own strikes. Its no secret that Barboza doesn't like to get hit and has a questionable chin. I see Barboza having a good round 1, but I think Johnson will catch him in round 2 with a overhand left and finish him with strikes. Johnson via 2nd round TKO. 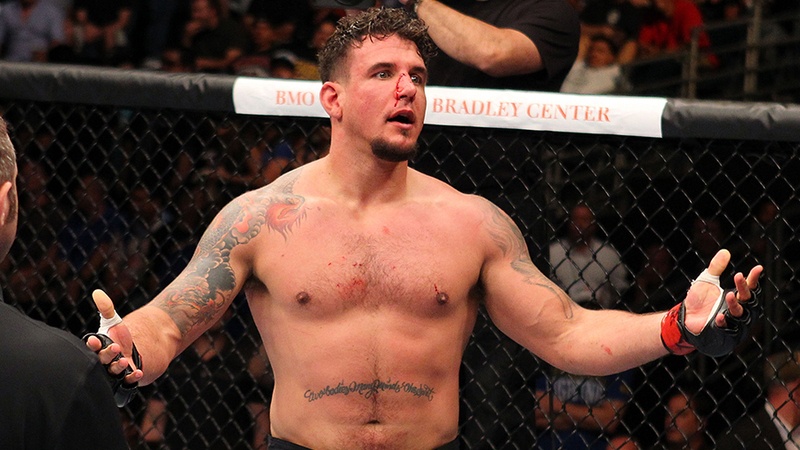 #13 ranked Frank Mir can be considered one of the greatest UFC heavyweights of all time. Held the UFC championship title twice, one being the interim title. Mir was the first to KO and submit MMA legend Antonio Rodrigo Nogueira. Mir possibly has the best jiu-jitsu in the heavyweight division. Rarely tries to take opponents down as of late, using his striking as his primary weapon. Has 4 straight UFC losses. #8 ranked Antonio Silva is a huge heavyweight, having to cut weight to make the 265 lb limit. Silva is 2-3-1 in his UFC career. The draw came against Mark Hunt in an epic 5 round fight, only to be ruled a no contest after Silva's drug test came back with elevated levels of testosterone. Silva has a lot of power in his punches. Throws a lot of slow, looping, powerful punches. Not very comfortable on the ground, can be controlled by opponents with good wrestling skills. 0-2-1 in his last 3 UFC bouts. Prediction: This is a tough one to call. Both of these fighters appear to be in the tail end of their careers. Mir has been easily outmatched in his last 4 fights, just absolutely non competitive fights at all. Silva also has been outclassed as of late. 2 quick KO losses in the 1st round, to go along with that amazing fight with Hunt, that took place between those 2 KO's. Hard to evaluate his performance against Hunt since he was on PED's. I can see Mir winning by a submission, but I could also see Silva winning by KO. Having said that, and going back and forth in my head for a couple of days (flipping a coin) I am going with Silva to get the KO, and giving Frank Mir his walking papers. Silva defeats Mir via TKO in the 1st round. Genius: Both guys' chins are becoming glassy at this point in their careers. Both guys move like robots as well. I can't see Mir taking Bifoot down straight up. I think this fight is a matter of who can land a solid punch first and who can eat a punch. I take Bigfoot by 1st round KO. I just don't think Mir can take a big shot anymore, but don't be surprised if Bigfoot gets KO'ed as well. We're all set for fight night. To get further hyped, follow @UFC_predictor and @mmagenius05 for more insight as we get closer to the event. UFC Broomfield: Henderson prevails, what's next? Previewing UFC Fight Night: Bigfoot vs. Mir, along with a prediction battle as two experts duke it out.